Okay, so I literally got this award 4 months ago, but that was back when I was still an unpublished, unappreciated artist, struggling to make due with the little money I had. I’m actually still an unpublished, unappreciated, artist that’s poor, so I guess that’s really no excuse. SO, I’m going to go ahead and post the rules and answer the questions now! After thanking the most wonderful erinkenobi2893 (loving the name darling…don’t think I’ve ever told you that). Rules: Show the icon on your blog, answer questions, make up new questions, nominate bloggers, and notify them of the nomination. What is the strangest thing you have ever said to anyone? UGH, I DIDN’T KNOW THESE WOULD BE HARD QUESTIONS!! How about I say the strangest thing I’ve ever thought about someone? Recently, that is. I’m pulling a Dory right now. So this one time, a random guy just walked up to me and started talking, and all I could think was “…He is cute. He is talking. He’s talking to me. Why is he talking to me?” I didn’t even completely register what he said until he walked away. Since my dad is having us watch The Avengers and all the movies leading up to them… who’s your favorite Avenger? ;-) CAPTAIN AMERICA. The Winter Soldier movie totally changed my mind. Before him, it was Iron Man. I love how arrogant but witty he was in all his movies. I think it’s hilarious. Which Avenger are you most like, in your opinion? In your friends’ opinions? None. My sister also says none. If you had to pick one–just one–fictional character to be caught with in the middle of a natural disaster (or a nuclear war, take your pick) who would you choose? Erm, captain america? I feel like he’d figure out a way to keep me alive. But then again, he’d probably try to be all heroic and sacrifice himself or something crazy like that. Superheroes these days….sheesh! Oddest thing you’ve sung in the shower? I was in a really random, ridiculously happy mood this one time, so I just put a tune to random words, and I sang it for awhile. I stopped in the middle of my shower, but then I picked back up randomly 2 hours later. I think it had something to do with potatos and cows and school buses, I don’t really remember. What book/movie/poem/short story has made the biggest impact on you lately? OH, THIS. I literally watched it an hour ago, and cried my face off. I also watched another one where a bunch of kids flash mobbed a NYC station (I would so love to do that…follow your dreams guys!) and one with little babies (I’m not sure how big the impact they made on my was…but THEY’RE SO CUTE). And, last but not least, what was the funniest thing you read recently? Please share! ;-) The comment I made for this post. I didn’t realize we were so funny. 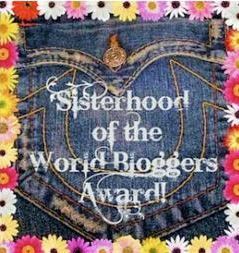 Nominations: I think the Sisterhood of Traveling-I mean, uh, of Bloggers, should be available to everybody! Boys included! LET’S MAKE IT WORLDWIDE, BABY. Oh wait…it already is? Well then…Oh well, anybody can answer my questions then! My Questions: I liked a lot of the original ones, so I’m going to just give the go-ahead to answer the same questions that I did! How do these posts end up being so long? And describing this book that she’s writing. Me: Wait, Hera can’t die. Me: Wait, it was malaria, wasn’t it. Me: Is Zesus dead too? I bet he had the flu. I already love Taylor, but this was absolutely AMAZING. I teared up, like, 3 times. I mean, the 2015. The year I’ve dreaded/looked forward too/put off (as much as you can put a year off). It’s been a very interesting first 4 days. But anyways, now comes the part where I address the problem of my lack of posting. I know that some of you have seen me here and there, reading and liking and commenting on different posts, but I haven’t posted anything since October 21st. I haven’t actually posted something since September 14th. That, my friends, is a very short amount of time in dog years, but I’m afraid that most of my readers are not dogs, so that leaves me no excuse. I must now jump off of a dock into the unknown waters of…um…the lake. Yeah. Just kidding, I have too many plans to do that. Yet. But ANYWHO, I have decided that, for your reading pleasure, I’ll post one of those What Was I Thinking?! posts. You know, the ones where you look back on previous posts and cringe. IT’LL BE GREAT!! 1. There’s No Place Like… I have no idea what I was thinking. This was the most stupid beginning post I have ever seen in my up-to-now existence. I didn’t even yell at anyone coming down my street. I lied to make it more uh…’interesting’. And what’s with the wondering what face a dog makes at birth? That just sounds crazy. 2. Doing Absolutely Nothing… I do not understand my obsession with putting “…” in the title. Apparently, I felt it was necessary here. And since when do you need to justify somebody is good looking? They were born so you could stare at them. That’s the price you pay when you’re good looking. 3. Not for myself, but for our world in neeed First of all, I would like to assure the world that I’m not crazy. Because this just sounded crazy. I didn’t do anything on this list, by the way, except for stick a marshmallow in a tree. Needless to say, it wasn’t that exciting. 4. Ahh…the Yew Near There’s actually not really as much wrong with this, I just didn’t even read 50 books that year. Fail. I didn’t put these in any particular order but if you want to, you know, cringe with me, be my guest.